Public sector bureaucracies have been subjected to harsh criticism. One solution which has been widely adopted over the past two decades has been to 'unbundle government' - that is to break down monolithic departments and ministries into smaller, semi-autonomous 'agencies'. These are often governed by some type of performance contract, are at 'arm's length' or further from their 'parent' ministry or department and are freed from many of the normal rules governing civil service bodies. 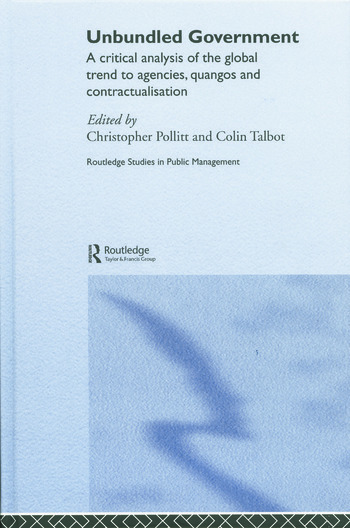 This, the first book to survey the 'why' and the 'how' of this epidemic of 'agencification', is essential reading for advanced students and researchers of public management. It includes case studies from every continent - from Japan to America and from Sweden to Tanzania, these 14 case studies (some covering more than one country) critically examine how such agencies have been set up and managed. Christopher Pollitt is currently Professor of Public Management at Erasmus University, Rotterdam. He has worked as a UK civil Servant, as an academic and consultant. He has been President of the European Evaluation Society and has advised many public organisations and the European Commission. Colin Talbot is currently Professor of Public Policy at the University of Nottingham and head of the Nottingham Policy Centre. He has worked in the public sector, as an academic and consultant and founded the consulting group 'Public Futures'. He has been a Special Advisor to the UK Public Administration Select Committee and advised many public organisations, in the UK and internationally.